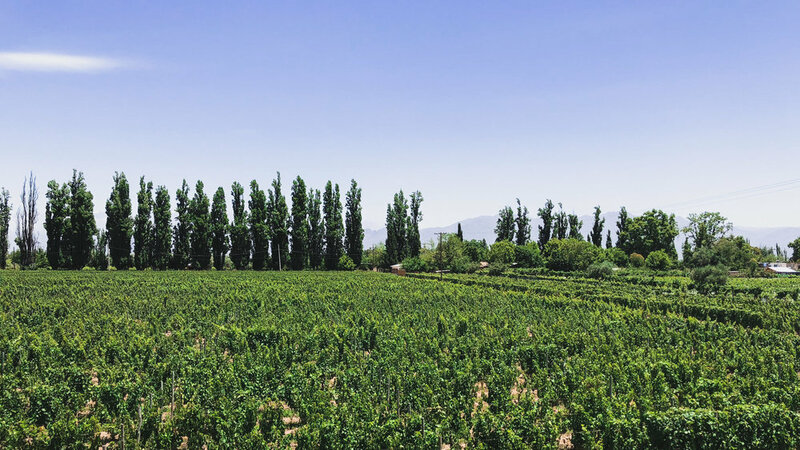 Mendoza: Wine Tasting and a Scenic Drive Through the Andes — THE ADVENTUROUS M.A.Z. Day 2: If you don't have time for a full day trip, like us, driving into the Andes is still well worth it. If you do have time, the highest peak in the Andes, Aconcagua, is a day-trip away. Ampora Wine Tours- I highly recommend going through Ampora Wine Tours after my experience (not sponsored). They work closely with 12 local wineries to provide unique and memorable excursions and tastings. 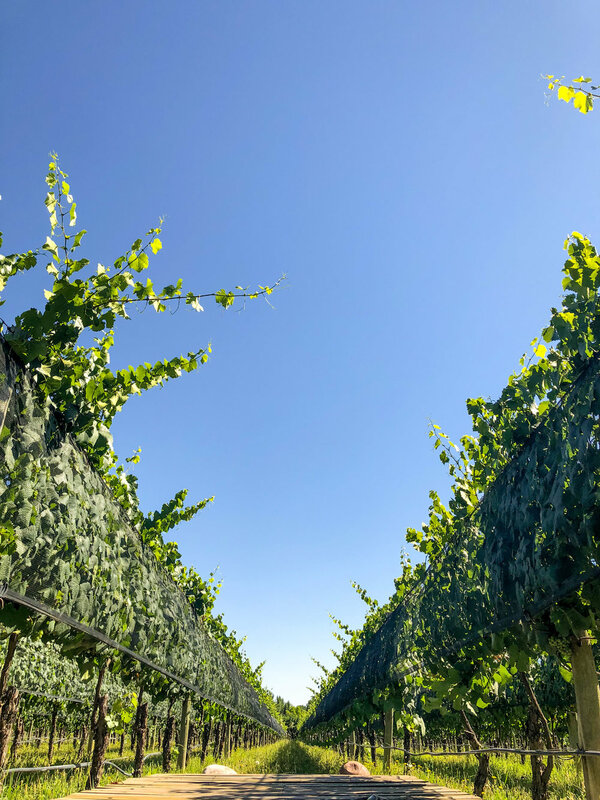 We chose to do a full day group tour of the Lujan de Cuyo region that included a driver, a guide, tastings at four wineries and a (late) 6-course lunch at the last bodega. The excursion cost $175/person. 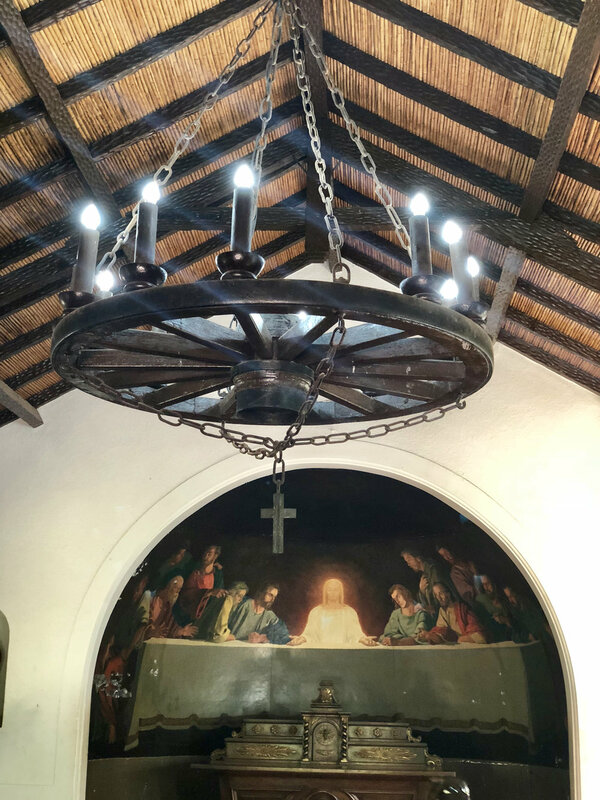 They offer an additional assortment of experiences including a tour of the Uco Valley as well as "Black List Tastings". It wasn't easy to choose one, but I was very happy with my choice! During our Lujan de Cuyo excursion we stopped at Kaiken, Matervini, Tres, and Lagarde (in order). Each bodega offered a unique and exclusive experience and all touched on different parts of the wine making process. Ampora switches up the agendas for these tours so you may or may not stop at the same wineries if you chose this experience. 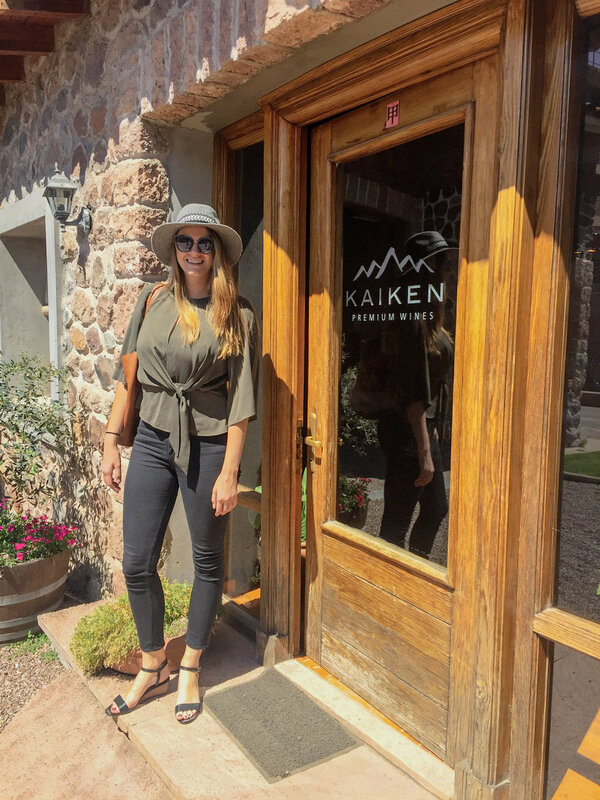 Kaiken- We tasted a rosé first here to get our taste buds ready at 10:30am. They walked us through their vines and showed us the different layers of the soil that help give the grapes their specific taste. Horse grazing between the vines. Matervini- Matervini was the favorite of the day for a number of reasons. First and foremost we got to take a taste of their "Alteza" label, which was crafted to fit the owners taste preferences. It happened to be my favorite wine of the day, but i'm not sure if that is just because it translates to "your highness". Additionally, Matervini focuses on the sustainability of their process. All the electricity and heat that they use is supplied via solar panels. They also compost their organic waste and return it to the vineyard. On top of the unique things they are doing to be pioneers in the field, Santiago Achával, co-founder of Matervini Winery, holds the accomplishment of creating a wine that received 99 Robert Parker points. This was done in 2009 at his previous winery, Archival Ferrer, next door. He sold the name and its grapes and created Matervini as more of a personal project. Our wine-making lesson at Matervini focused on teaching us about the fermentation process. BONUS: They are able to ship to the United States for free-- very rare! Enjoying a tasting of Alteza, a wine created by the owner to play to his own taste. Alteza translates to "your highness". Art by the owner's daughter. Outdoor tasting area at Matervini. Our guide, Augustín, getting to know the group. Barrels holding an exclusive batch of wine. Matervini produces only about 25,000 bottles per year and doesn't sell to distributors. Tres- This bodega is in a beautiful silo looking building. We were talked through the aging process at this winery. Lagarde- Tasted six wines over a six course meal -- by tasted I mean we had 5 full glasses of wine that kept getting refilled and a tasting of "Henry" at the end. Each course was inspired by a region in Argentina. Lagarde focused on teaching us proper wine/food pairing. We were picked up from our Airbnb around 8:30am and returned around 6:30pm. The other group we were paired with was staying at an estate outside of the city and their pickup and drop-off was accommodated. While Ampora claims to try to limit groups to a maximum of eight people, we ended up with nine on our tour. This didn't take away from our experience at all. Bonus: At the Ampora storefront in Mendoza they sell Styrofoam insulated boxes where you're able to pack the bottles of wine you purchase throughout the day. You can even check the box as luggage on your flight. The one thing that was harder to come across was packing tape. Our guide, Jose, was extremely knowledgable about the wine industry and really about Argentina in general. Check out what he has to say about visiting Mendoza. Being so close to the Andes, my family decided to add a hike to our agenda. Without much of a plan, we picked up a rental car on the morning of our last day. The guy manning the rental booth at Localiza drew us a map of the route he suggested we take. My dad loves getting lost in the countryside of wherever we travel, so we literally just went off this hand drawn map to get around... luckily there weren't too many roads to get confused by. The directions took us along Route 7 and Route 52. Potrerillos was the first stop of the journey. We pulled off and walked to find a vantage point to appreciate the glacial blue water. From there we followed our hand drawn map and drove further into the mountains, until we got to Uspallata. The town of Uspallata has a population of about 3,500 people which sounds bigger than it felt. For lunch we stopped at a local Argentinean style barbecue joint, or parrillada. Over lunch we decided to take the smaller and slower Route 52 to complete our circle back to Mendoza, rather than going back the same way we came. This narrow, winding, dirt road did in fact lead us back to Mendoza, but not without a lot of laughs and a moment of panic. Look out for Cruz De Paramillos. This is the one place you can see Aconcagua, the highest peak in the Andes mountain range. 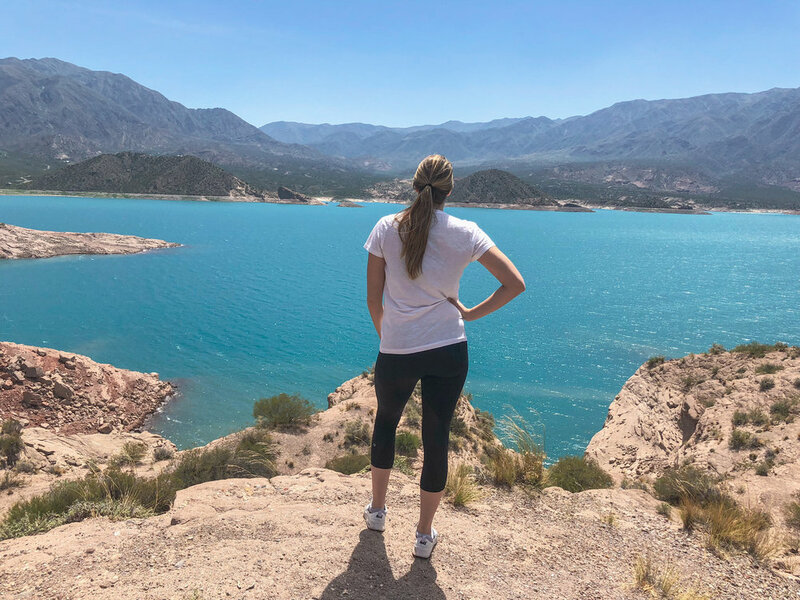 Along the way we found ruins, a view of Aconcagua (the highest peak in the Andes), amazing views of the mountains in genral, wild guanaco, a wild horse, a plaque in honor of Charles Darwin, and an abandoned resort/church. If you're curious about the somewhat random location of this resort, it turns out that it is actually the mineral water that sparked the construction of the hotel. It attracted guests because they could soak in the thermal pool and even fill the baths in their room with the thermal water. The local guy from the car rental place mentioned something about European immigrants not being able to go home during WWII due to the turmoil and that the resort was a way for the immigrants to get a taste of a home-like vacation without actually returning. I didn't find that fun fact in my research, so going by the local folklore. Unfortunately, the inside wasn't open to explore. But if you have time for a hike, there are trails from here where you are supposed to be able to see some unique flora and fauna. There was an entrance fee-- it was about USD$7. As we approached our car after exploring the once abandoned resort Villavicencio, we noticed that we had a flat tire and two hours until our flight departing out of the airport that was at least an hour away... We unpacked our meticulously stowed luggage, dug out the spare tire, and my brother changed the flat like he was part of a NASCAR mechanic crew. MVP of the day! The whole family, our bottles of wine, and one dusty car made it to the airport just in time for our flight to Buenos Aires. This was a day of adventure that I know my whole family will never forget. Azafran kept popping up when I did my foodie research and was even recommended by multiple Argentinians. These photos do not do the food justice. I wasn't able to get a reservation in advance, but we lucked out and secured a table al fresco. They have a large table in their cellar that looks out to the street -- I'd suggest trying to get a reservation for that table if you go. When selecting your wine at Azafran you are not brought a wine list, rather the Sommelier walks you into their cellar and helps you select a bottle that aligns with your taste and budget. Their olive oil was also phenomenal-- my mom and I each bought a bottle of it to continue to enjoy the taste of Mendoza at home. 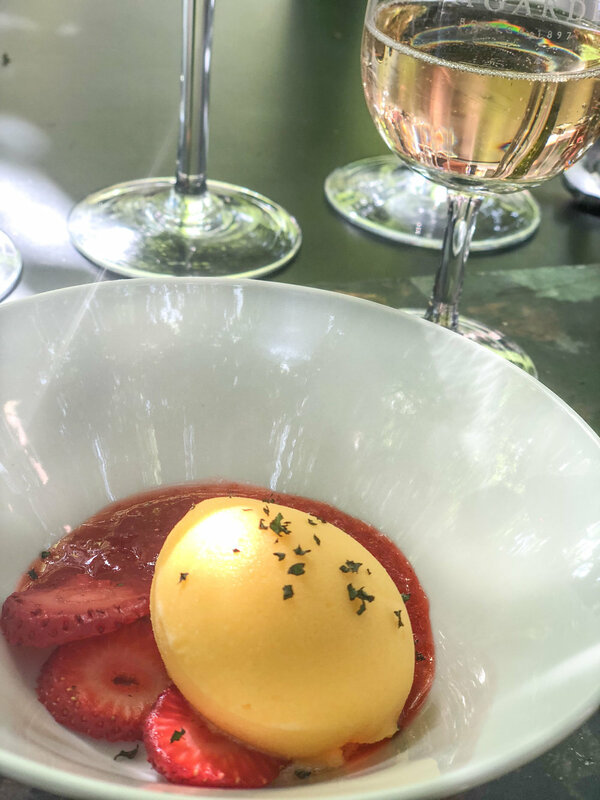 Anna Bistro- My family has somehow been cursed with always trying to find food when the local spots are closed down no matter what country we are in... Mendoza was no different. The best part about Anna Bistro for us was the fact that it stays open all day. The food and setting fulfilled what we were looking for in our mid-afternoon meal. The menu was nothing out of the ordinary, but it had good staples and something for everyone. If you're looking to satisfy your sweet tooth you can stop by Brilliat Savarin, the pastelería next door. El Botellón- After being 'malbec'd out' from our day of wine tasting we stopped into El Botellón for some craft beer with what seemed to be a local crowd. María Antonieta Restaurant- I didn't end up eating here but it came highly recommended by multiple people. I booked a great apartment through Airbnb. It was about two blocks from Plaza Independencía. Our host was great and the place had everything we needed, including a washer. 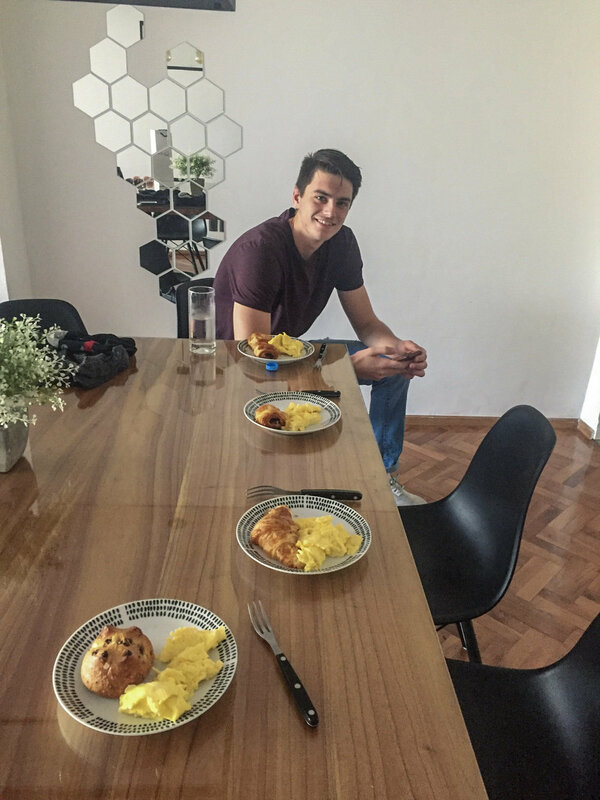 The only photo I have of our Airbnb is my brother modeling with our pre-wine tasting breakfast. We picked up pastries from Brilliat Savarin the day before. I recommend a remis. While it sounds fancy to hire a driver it actually makes life a lot easier in Argentina and will probably only cost you a couple dollars more than a taxi. Mendoza is VERY walkable. If you're in a hurry, taxis are pretty cheap. They are metered, but it will probably only cost you ARS $30 to get across town. They didn't have Uber yet during my visit in January 2018. I highly recommend booking a tour so you don't have to worry about drinking and driving. The tasting pours were quite generous. Ampora Wine Tours was an amazing host. They picked us up and dropped us off at our AirBnb. We booked a car rental through Localiza to drive to a location where we could hike. We actually ended up on a long drive through the Andes thanks to a hand drawn map from the kiosk attendant. I booked us a small, four-door car thinking we wouldn't be in it long. If you're going for a drive like this with four people, do yourself a favor a "splurge" on a larger car. Find other details about transportation through ExperienceMendoza.com. Comfortable shoes- You'll be on your feet a lot as you tour the different wineries. By the end of the day my feet were pretty tired. I recommend at least putting a pair of flip flops in your bag if you're pressed on being a slave to fashion. Camera- I used my iPhone X during the whole trip and it made great photos. Phone Plan- At the time of this trip my provider had 3 different travel plan options. The one I decided to purchase allowed me to use my phone like normal, even though I was abroad for $10/day. There were other less expensive options. If you plan to use any cellular data or make phone calls while you're traveling in different countries make sure to call your provider to let them know, otherwise your phone won't work unless it is on wifi. SpanishDict- Great app to download if you aren't doing unlimited. You're able to look up translations without wifi. Duolingo- Helped me brush up on my Spanish before vacation. 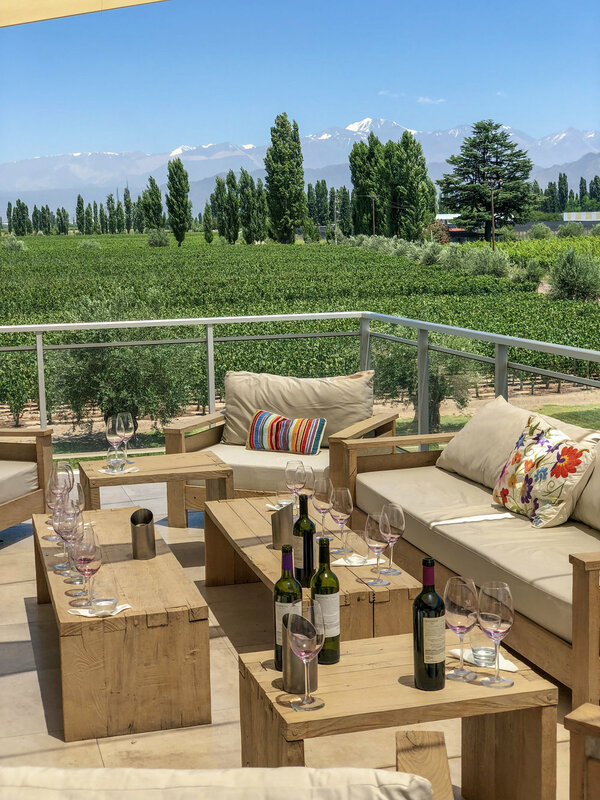 When I got back to Mendoza I would try to stay three to four days versus two. I will definitely book another excursion through Ampora Wine Tours. I'd also think about staying at an estate for a more tranquil getaway. 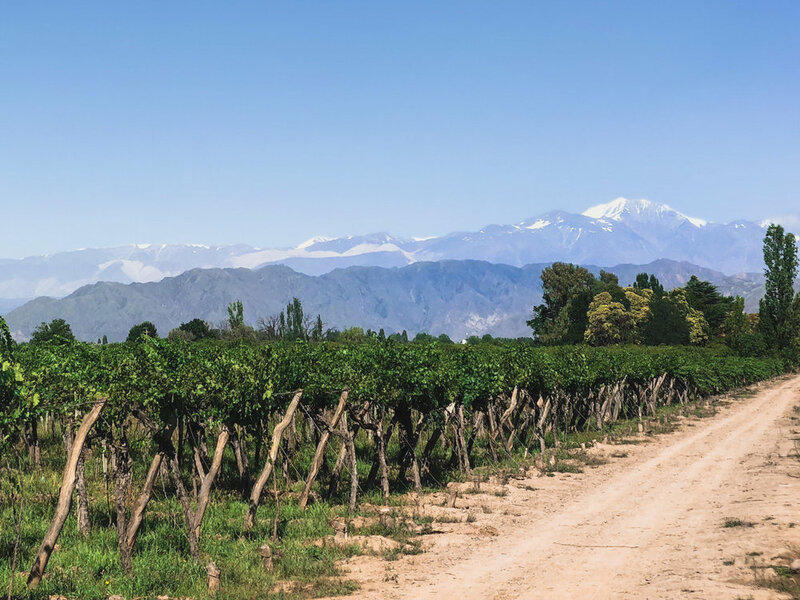 The more northern wine region, Salta, will also somehow fit into the itinerary. Hiking to the base of Aconcagua is another adventure on my list. I was sad that we didn't have enough time for this since we were so close. It would be fun to road trip from Mendoza over to Chile and do this hike along the way.